You could also call this "Free Nexus5 if you switch from AT&T or Verizon." Here's a comparison of the plans and how I arrived at the idea of "Free" Nexus 5. This chart shows how much money both of these plans cost. 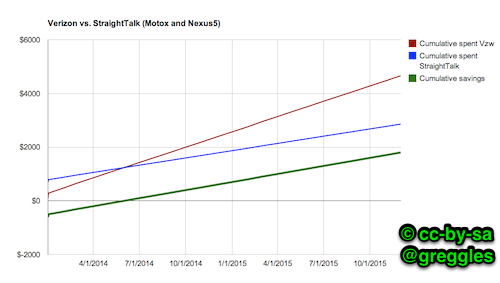 I used a MotoX as the subsidized phone since it is similar in specs to the Nexus 5. Let me say that again: $1,800 savings in a 2 year cycle! 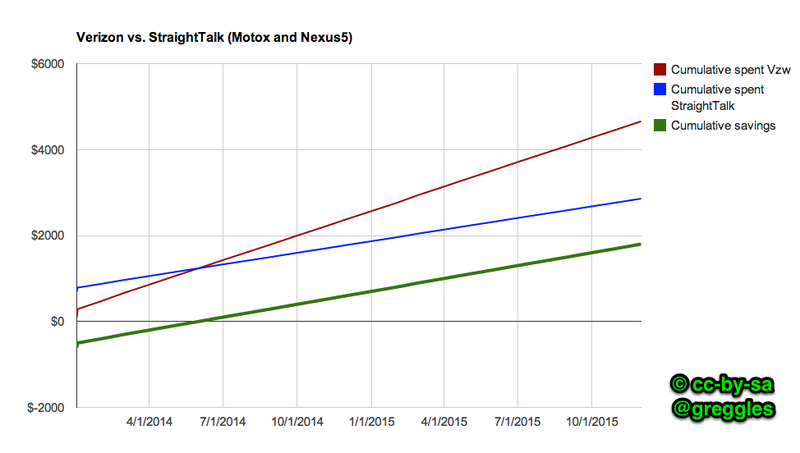 We could actually buy a new Nexus phone (or similar) every year and still save money compared to Verizon. Once you've gone beyond a trivial number of Jenkins jobs you can get into a situation of not knowing which job does which thing. You might say "I know some job is running a query on a table, but which one?" in that case it can be helpful to search your Jenkins jobs. We have two strategies for managing Jenkins jobs: put short scripts into the job itself, but move longer jobs into code somewhere else. Most jobs use the "execute shell command" Build Step. I also use and recommend the JobConfigHistory plugin to see how a job has changed over time (or who fixed/broke things). When the number of lines in your "shell script" section of the job gets over a maybe 3 or 4 I think it's time to move things to "real code" that is managed by a revision control system with more power than the JobConfigHistory plugin (i.e. git). So, we tend to put things into one of four places: R scripts, Pentaho jobs, Drush commands or bash scripts. All of the R scripts, drush commands and bash scripts are managed with git. The working checkouts of those directories are updated periodically (...by Jenkins jobs :)). So, if I want to grep that external code to see where a particular table is being modified it is very easy to do that. But...what about the one or two line shell scripts that are inside Jenkins jobs? Software management on Mac: Why is it so bad for users? The app store - obviously this is what Apple wants, but they have rules about what can and can't go there and the rules don't match the rules their customers want (e.g. easy in-app purchases) but instead what Apple wants (more money). Download software from a website and install it. This works OK, except that the vendor has to get a key that is verified by Apple (which has its own legal paperwork for the developer to pretend they read). If they don't get a key then the user has to follow this Apple knowledge base article that includes advice to control click, use the context menu, answer a dialog and then it will work. That was simple, right? If you downloaded software from a website, it might update itself (For me, Sublime, Source Tree, and Adium all do this). OR, you might have to periodically go back to that website and see if a new version is available and then download and install it (Looking at you, Dropbox). Homebrew, Macports, etc. What is this, Gentoo? Since when is compiling source all the time a user friendly idea. My favorite scenario? When I need to get software X which comes via one channel. But I have to also get something it requires which comes via a different channel. Rough. The App Store is clearly the most user friendly option, but as a user or developer I have no control to adjust its behavior. I can't say "Get stuff from the official Apple channel but also get new software and updates from the Dropbox website. Glossing over the issues with unsigned packages, having a variety of different methods to install software that are inconsistent with each other means I have to spend more time remembering and researching the software. Read more about Software management on Mac: Why is it so bad for users? For the past 1 year, 1 month, 1 week and 1 day I've been working at CARD.com. I love it. I've had a lot of great jobs in my career so far, but this is one that is truly extraordinary. I'm currently pretty enthusiastic about a set of quotes from Jeff Bezos compiled at fool.com, so I'm sprinkling some of those through this post. CARD.com is the world’s first likeable financial company. We make payments fun, fair and fashionable. CARD.com offers Visa cards and MasterCard cards featuring card art and amazing perks from the best brands in the world, like Star Trek, Elvis or The Walking Dead. And...that's a good description of what we do. But, what do I think we're doing that is exceptional? We're doing everything with an eye towards scalability. We have a lot of card designs and many more are coming. Some of our designs are big and some are small. We still want to delight the people with a "small" brand because to them that brand is their life. Bezos said "Your margin is my opportunity." and we're following that. We aren't aiming to be the cheapest provider, but we are undercutting a lot of other providers with what we believe is a much better product. That will help us scale and as we scale big we win. It feels great to provide a product that is competitive with other options available to our typical cardholder. Since we're scaling big, we sweat the small stuff. We review contracts to see how we can squeeze pennies or fractions of pennies out of different transactions.